Should You Replace Your AC before Next Year? It may not feel like it quite yet, but we’re slowly approaching the end of summer. Or maybe you do realize summer is almost over, in which case you might have decided that any AC repair needs you have can wait. But, why wait? Really, why wait and just allow these problems to grow, potentially leaving you with a completely broken down cooling system when you need it next spring? Not to mention, the end of summer is actually one of the best times to have a professional HVAC technician look over your system and make any adjustments needed, to make sure it’s in good shape. Yes, we usually recommend this service before summer begins, but here’s the thing, it matters more that you have it done once a year than it does what month you have it done in. 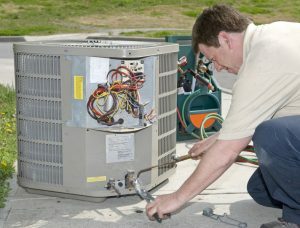 So, if you need a repair for your air conditioning in Midwest City, let us take care of it now. What AC Problems Should I Watch Out For? If you did have maintenance done before summer came, your air conditioning system is probably in good shape, and you may not have much to worry about in terms of a full cooling system breakdown before you need it again. However, it’s a good idea to be aware of the following possible repair needs anyway, since your air conditioner does go through an awful lot of work. A Fan Problem: There are two fans within your air conditioner. There is the blower fan, which is also known as the evaporator fan, and the condenser fan. These fans allow the cooled air to circulate effectively within your living space. After a long summer of moving air, the fan blades can become loose, worn out, or you can experience electrical problems. Refrigerant Leak: There’s a still common misconception that refrigerant is something that runs out, like gasoline in a car. This is not the case though—your air conditioner is supplied with enough refrigerant upon installation to ideally last its entire lifespan. So if you are losing refrigerant, it means that you have a leak. This will usually be evident by a loss in cooling power. Other signs you can watch out for is a hissing or bubbling noise coming from the unit, and a frozen evaporator coil, which we’ll talk more about in a moment. Dirty Coils: Your AC system has both an indoor and an outdoor coil. These work to regulate the heat exchange process to provide you with cool air. In other words, these coils work together to remove heat from the indoors, release it outdoors, and cool your air through the refrigerant process to bring cool air back in. Frozen Coils: Refrigerant leaks are a culprit for this problem, as are dirty coils. These are both problems that can lead to the same result. Ice on your coils means that those coils cannot properly absorb heat, and therefore your air conditioner simply can’t do its job. Remember, you can’t thaw or remove the ice on your own, since doing so can damage the system and doesn’t resolve the actual problem, but we can help you with this. At Comfort Incorporated, we keep your family safe, healthy and comfortable–call today, service today!